Pro government trade unions protesting opposite the State Engineering Corporation today, charged that Minister Wimal Weerawanshe has over 35 vehicles for his personal use and were filling the corporation with henchmen who are given bogus posts. The convener of Joint Trade Unions Thushara Gunarathne said that Minister Wimal Werawanshe is directly responsible corruption in the corporation. “ The Minister has over 35 vehicles for his personal use, he also has given his henchmen bogus posts and they are paid huge salaries without even reporting to work” he charged. 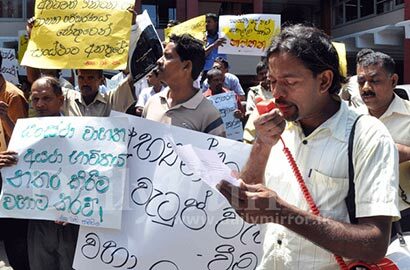 Gunarathne went on to state that all trade unions attached to the government participated in the protest. “The significance of this protest is that all trade unions attached to the government participated in this. We urge the president to intervene and stop put a stop to the rampant corruption in the corporation and to increase our salaries” he said. The Convener said that around 3000 employees of all levels participated in the protest. The Trade Unions vowed to continue their protests until their demands are met. Panchayudhaya has proved beyond all doubts that he has no other value than being a Pacha Ayudhaya. Can you remember his last minute statements that Sarath Fonseka not having Sri Lanka citizenship. His anti-Americanism was well tested when he sent his wife on a vacation to Disneyland in California. No other politician has lost his credibility so fast. What is he doing with 35 government vehicles. Running a small business I suppose! Do politikkas have credibilities to lose..? ක්රෙඩි-බිළි-ටීද, ක්රෙඩි-බල්ටිද, බොඩි-බිල්ටිද…? If no one of them, then it might be Credi-Bullshits..!